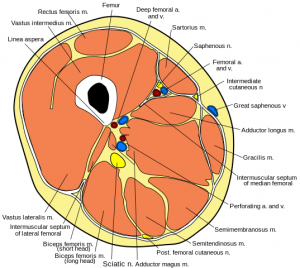 The Adductor Magnus muscle is one of six muscles in the medial compartment of the thigh. Adductor Magnus is a broad triangular muscle forming a septum which divides the anterior muscles from the posterior aspect of the thigh. It is the largest muscle in the medial compartment. It lies deep to the adductor brevis and the adductor longus. Inferior pubic ramus, ramus of ischium (anterior fibres), and ischial tuberosity (posterior fibres). Medial to gluteal tuberosity, middle of linea aspera, medial supracondylar line, and adductor tubercle of medial condyle of femur. 1.Adduction of the hip joint. 2. The anterior fibres which originate from the rami of pubis and ischium may assist in flexion, while the posterior fibres that arise from the ischial tuberosity may assist in extension. The adductor magnus has a large hip extensor muscle moment arm, making it an unappreciated hip extensor. The hip extension moment arm length of the adductor magnus changes with hip angle and it is a more effective hip extensor than either the hamstrings or gluteus maximus when the hip is flexed. The peak contractions of the muscle are seen in positions of hip flexion for eg. full squats. During Loading response: the adductors may be eccentrically controlling internal rotation of the femur at the hip rather than the previously reported role as concentric internal rotators. During Terminal Stance and Preswing phase: these muscles may also concentrically produce external rotation of the femur at the hip. Physical therapists should consider this important function of the hip adductors during gait when evaluating a patient and designing an intervention program. 4. Adductor Magnus is a major stabilizer of pelvis. While walking and running adductors stabilize hips and lower limbs to avoid excessive internal rotation. Also known as Hunter’s canal or subsartorial canal. It is a narrow conical tunnel located in the thigh. It is 15cm long, extending from the apex of the femoral triangle to the adductor hiatus of the adductor magnus. The canal serves as a passageway from structures moving between the anterior thigh and posterior leg - the femoral artery, femoral vein, nerve to the vastus medialis and the saphenous nerve (the largest cutaneous branch of the femoral nerve). The apex of the adductor canal is marked by the adductor hiatus – a gap between the adductor and hamstring attachments of the adductor magnus. direct and perforating branches of the deep femoral artery. The commonest type of groin strain or injury is believed to be adductor related. They are seen mostly in athletes, ice hockey, and football players. Predominant in male athletes. The source of groin pain is difficult to diagnose due to the involvement of many muscles; iliopsoas, adductors and glutei and also due to proximity to the pelvis, hip joint and sacrum. It has been suggested that mechanism by which adductor muscle strains occur is the requirement for rapid deceleration of the lower limb undergoing rapid abduction and external rotation as occurs in ice-skating or during fast changes of direction. When skating, the body has an increased need for stabilization at the hip and thigh due to the thin blade that skaters must balance on. In addition to the inherent instability of skating, these athletes use explosive movements into extension, abduction and rotation at the hip, relying on an eccentric contraction of the adductors to decelerate the leg during a stride. These repeated eccentric contractions of the adductors during both fast and slow skating can lead to inflammation of the adductors. Main symptoms following an injury are: pain, tender swelling, any action which holds the knees together will be painful and outward movement of the hip will be restricted by spasm and pain. Tight adductors can cause knee pain, especially seen in runners. The function of the adductor muscles is to pull the thighs together and rotate the upper leg inwards, as well as stabilising the hip. The adductor magnus appears to display a relatively mixed muscle fibre type proportion, albeit with a greater proportion of type I muscle fibres. Postural (type 1) have the tendency to shorten when chronically stressed. These muscles may be torn at their origin from the pelvis or in their bulk on the inside of the thigh. It is an unusual cause of acute arterial occlusion in younger men. It is the result of arterial compression (superficial femoral artery) by an abnormal musculotendinous band arising from the adductor magnus muscle and lying adjacent and superior to the adductor tendon. The pathogenetic mechanism of this syndrome resembles that of popliteal fossa entrapment and can become manifest after exercise. Since this syndrome occurs in younger men in whom acute arterial occlusion can lead to limb loss, recognition of the presence of apparent ischemic symptoms after exercise in an otherwise healthy young man is important. The treatment consists of the division of the abnormal band and restoration of arterial continuity by appropriate means. A search for bilateral lesions can help avoid future problems even when the symptoms are unilateral. The tendon of Adductor Longus is the most proximal tendon amongst the adductors of the hip joint, Gracilis is medial to the Adductor Longus. 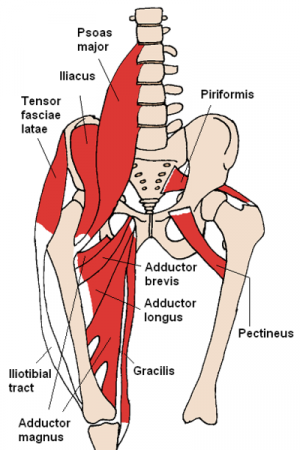 Adductor Magnus lies posterior to Gracilis muscle. Adductor Magnus is palpated on the medial aspect of the thigh while resisting the hip adduction against resistance and feeling for the engagement of the musculature. Test: Adduction of the underneath extremity from the table without rotation, flexion, or extension of the hip, or tilting of the pelvis. Strength is graded by pressure applied over the medial aspect of the thigh in the direction of abduction i.e downward towards the thigh. Insufficient length of muscles results in contracture of the hip adductors or hip adduction deformity. In standing, the pelvis is laterally tilted, it is high on the side of contracture; making it necessary to plantarflex the foot on the same side so that toes touch the ground. As an alternative, if the foot is flat on the floor, the opposite extremity is either flexed at hip joint or abducted in-order to compensate for the apparent shortness of the adducted side. ↑ 2.0 2.1 2.2 2.3 2.4 2.5 2.6 Kendall, McCreary, Provance; Muscle Testing and Function with Posture and Pain 4th Edition; Hip adductors; Page No.228.